An eclectic art scene, a spirited sporting history and a lively atmosphere – welcome to Cardiff, a city that oozes character and heritage. Europe’s newest capital city on the block, Cardiff buzzes with life, combining eye-catching modern architecture with historic treasures that are waiting to be discovered both within the city and beyond. Car rental in Cardiff allows you to travel conveniently – whether you’re here for business or pleasure – and fit more into your trip. We have a number of conveniently placed pick-up locations across the city including at Cardiff International Airport, so we’ll get you into your vehicle and out on the road as quickly as possible. Crammed with eye-catching sights to capture the imagination, events that will entertain the whole family and quality shopping to entice those in search of serious retail therapy, Cardiff is a city that deserves to be explored to its fullest. Cardiff is steeped in history, with the remarkable Cardiff Castle sitting proudly in the heart of the city. Part Roman fort, part reimagined medieval fantasy, the castle presents an intriguing mix of styles and periods. The Norman invaders used the site of a 3rd century Roman fortress to build a castle here in the late 1100s. The scene of a number of battles, it had fallen into ruin by the time it was extensively remodelled in the 19th century for coal tycoon the Marquess of Bute. What emerged was a spellbinding example of Gothic revival architecture that can still be seen today. A trip inside the castle itself reveals an interior dripping with opulence. Spend some time exploring the lavish, mural-adorned banqueting hall, while spotting sculpted angels leaning in from the rafters. Step back in time at St Fagans National Museum of History, an open-air museum featuring re-erected dwellings from different eras. From a traditional farmhouse to beautiful old cottages, you’ll walk your way through glimpses of Wales’ rich history. For all its history, Cardiff is a city that has one eye firmly on the future, as evidenced by the gleaming modern architecture on show. Head down to the Cardiff Bay waterside area and you’ll see the city’s bold regeneration in action. “In these stones horizons sing” reads the eye-catching facade of the beautiful Wales Millennium Centre. It’s a line from a song that was specially commissioned for the building’s opening and one that perfectly summarises the forward-thinking nature of the whole city. There are no fewer than three theatres within the centre, housing Wales’ national orchestra, theatre, dance and opera companies. Enjoy an evening being entertained by world-famous names, smash-hit musicals and must-see plays. The busy Cardiff streets offer up a mix of major retailers and small independent shops. The number of independent arcades dotted around the centre will keep fans of unique or vintage goods busy. Many of Cardiff’s arcades are a fusion of Victorian and Edwardian architecture, making the destination part of the appeal. Browse retro clothing at Morgan Arcade, pre-loved records at High Street Arcade and explore an eclectic selection of boutiques at the Royal Arcade. Once you’ve worked up an appetite you’ll be pleased to find this capital city is no stranger to tantalising the taste buds. Whether you’re after a hearty Welsh breakfast at popular café Milk & Sugar or contemporary Japanese cuisine at Yakitori#1, Cardiff offers something for every taste. A love of sport pulses through Wales, and nowhere else is it felt more keenly than in the capital. Catch a match at the mighty Principality Stadium – the largest capacity sporting venue in Wales. Swap spectator sports for something you can dive right into at Cardiff International White Water. Hop up on a surf board to catch some waves in the simulator, duck, roll and weave your way through a white-water rafting adventure or head off-site to clamber up rocks and under waterfalls during an exhilarating gorge walk. 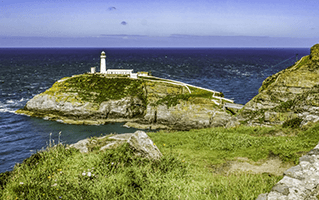 Don’t leave without taking advantage of the glorious drives in and around Cardiff, passing through spectacular scenery and varying landscapes. The A4069, connecting Llandovery with Gwaun-Cae-Gurwen, has become world renowned as one of the best routes to drive in Wales and is a must for motoring enthusiasts. If you’re looking for a Welsh road trip, the A470 that runs for nearly 300 km from Cardiff to Conwy in North Wales. Along the way you’ll encounter the Brecon Beacons, a national park filled with scenic landscapes, lakes, caves, waterfalls and amazing places to eat and sleep. It’s another fantastic place in Wales for water sports as well as abseiling, horse riding and simply gazing at the star-filled night skies. Car rental in Cardiff opens up the best of the city and beyond, allowing you to explore the beauty and passion of Wales at your own pace. While it may be located on the coast, Cardiff is well connected to the rest of Wales and the southwest of England. The M4 skirts around the top of the city, connecting Cardiff to English cities like Bristol in the east all the way through to Swansea in the west. Closer to Cardiff is the A48, which crosses the River Taff and takes you to the north of the city. This connects to the A4232 which runs down the west of Cardiff. Driving within the city itself, you’ll find the roads are well-signposted and easy to navigate. If there’s a sporting event on while you’re here, be sure to allow extra time for travel. Sporting culture is a huge part of the city’s identity, and big games can occasionally see the centre closed to vehicles. Outside of Cardiff, the rugged Welsh landscape makes for a picturesque backdrop. With well-maintained roads and free moving traffic, especially on the smaller routes, driving in Wales is a pleasure. Leave Cardiff via the M4 and in less than an hour you can be enjoying sea air in Swansea Bay, or take the A470 to Castell Coch, a fairytale castle that has been featured in hit TV show Doctor Who. A 90-minute or so journey on the M4 and M5 will transport you to the elegant spa town of Cheltenham, a gateway to the scenic Cotswolds. For more information about driving in Cardiff and the rules of the roads within the United Kingdom click here.